From the earliest times, the Churchyard was part of the Rector's Freehold, but he or she cannot sell any part of it. In past times Rectors of Farnborough would have received fees connected to use of the Churchyard. Now, all fees are paid to the Parochial Church Council. People pay a fee to be buried in the Churchyard but cannot buy a grave space as is possible in a public cemetery. However tombstones remain the property of the family who install them. The permission of the Rector is required before a monument is put in place, and it must comply with the regulations of the Diocese, which are set down by the Diocesan Chancellor. Until the 18th century, there were no tombstones in the Churchyard. The ground was re-used time and time again, resulting in the level gradually rising, as can be seen by comparing it with the level of the paths. The Yew Tree was at the North West corner of the Churchyard when it was planted in 1643. From the mid-1700s, tombstones came into use, and by 1854 the Churchyard was full of Memorial Stones, making re-use of the ground impossible. The photo on the left above shows burial stones marking the edge of the original ancient burial ground. The earliest burial for which there is a surviving gravestone is for a Barbara St. John Cooper, shown on the right, who died 11th October 1751 aged 69. She was buried four days later. 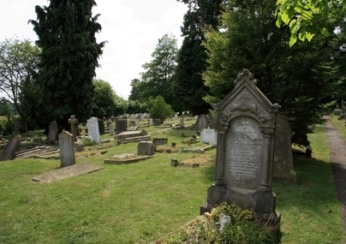 Extra ground, 0.4 acres, was therefore purchased round the north and west sides of the original graveyard, which sufficed until the first part of what we now call the 'new' graveyard was opened in 1885 after Farnborough became an independant parish. The ‘Lower Gate’, we can place with some certainty. It was at the bottom of the slope next to the roadside wall leading from the road along the south side of the church, and ‘The Hole’, which was the chalk pit partially filled in 1909, and now the car park. We must remember that at this time the road would have been more or less on a level with the churchyard as the lowering of the carriageway did not occur until 1833, and thus the entire churchyard would require fencing. The ‘Church Gate’ (not called a Lych Gate) was some fifty feet nearer the church than the present one. If we use measurements guided by the position of the grave stones pre 1749 and excluding those after 1885, when we know that the churchyard was enlarged, we establish a very small area round the church, but one which is in agreement with the figure quoted in the Tithe Assessment of 1840 of 1 Rood and 15 Square Poles ( 0.35 Acres). The 'Church Gate’, was in a position now occupied by the Skeggs Tomb, behind the small hedge, to the left after entering the Churchyard through the present Lych Gate. This is a good example of a table tomb which, although it has lost its original railings, would have been similar to those retained by two other examples near the church door. The present Lych Gate was erected in 1902 as a memorial to Rachel Fox. The Churchyard contains good examples of tomb stones showing how tastes have changed over the centuries, and some examples are marked on the plan. The oldest stone dated 1725 is an elaborate set of the body stone type, with Head and Foot stones, and is situated by the fir tree to the West side of the path leading to Church Field. The Wynne Stone, made of local rag stone, near the Choir Vestry is more typical of the age, as are the slightly more elaborate examples to the South of the Clergy Vestry, hiding behind the table tomb, to the Rance Family. The Churchyard was extended over the years as the need arose. This can be seen on the Churchyard Map. The Evans/Butterworth tomb in the western part of the Victorian extension is a good example of an ‘Architectural’ memorial, while the March Bronze of the ‘Fallen Angel’ illustrates the fine work of this talented local family who supplied the bronze figures for the Canadian National War Memorial in Ottawa. The Lubbock Cross, which stands just beyond the Garden of Remembrance, is well worth close inspection. The symbols carved on it, Bronze Age Axes, The Avebury Stone Circle and even a Bee Skep, commemorate the many activities in which the family excelled. 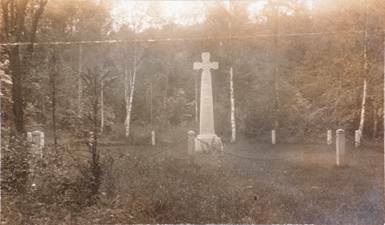 The Cross had formerly been positioned in the Lubbock Family Burial Ground located in nearby woodland leading to the High Elms estate. 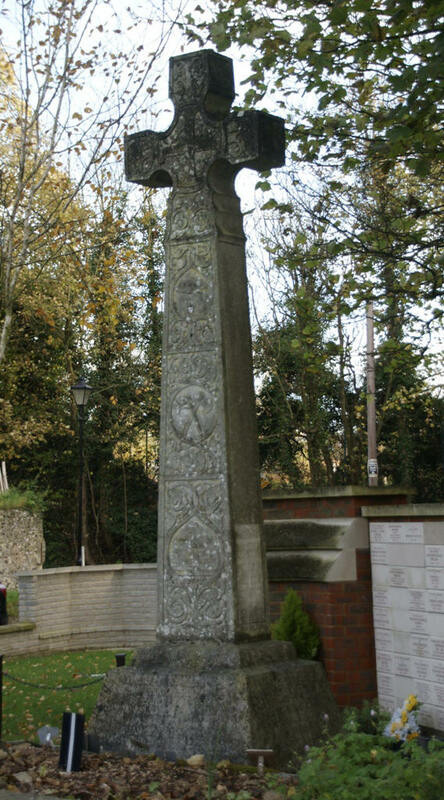 The cross, together with a number of family bodies, were moved into the St. Giles churchyard in about 1986. War Memorial The War Memorial was designed by Fred Harrild M.A., A.R.I.B.A., funded by parish subscription, and erected in 1922. Since that date it has been the location for the annual Act of Remembrance. 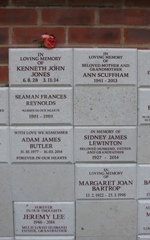 The most recent addition to the churchyard is a Memorial Wall, to provide space for Plaques to commemorate those whose ashes are buried both at St. Giles and elsewhere. This has proved very popular, and has been extended a number of times. In the Victorian Extension there is the famous ‘Gipsy Lee’ grave. 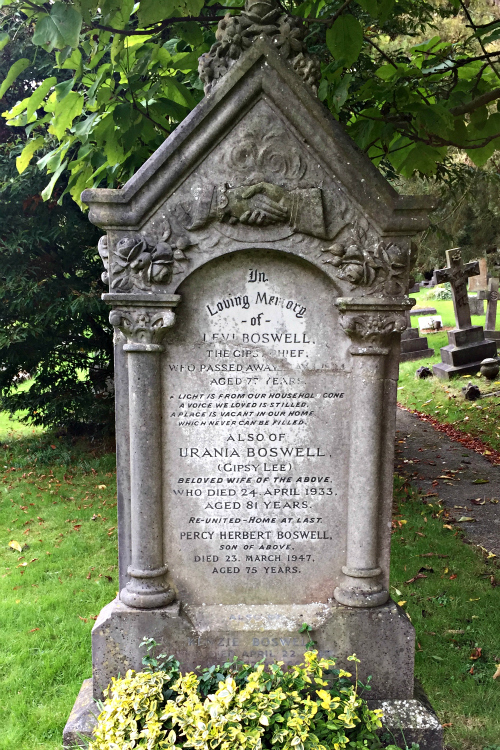 Her Real name was Urania Boswell. She died in 1933. The grave is the resting place of four members of the Boswell family in total. YouTube video of the procession. She was the last Gipsy Queen in the area and lived for the later part of her life in Willow Walk, Locksbottom. The gate at the end of the churchyard leads out onto open common land.